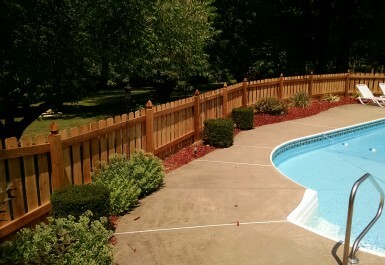 There are many reasons to have a wood fence installed on your property in Belleville, Illinois. Perhaps you’re looking for a low-cost way of keeping your pets from wandering out of your yard, or maybe you’d simply like more privacy from your neighbors. No matter what your reasons, Chesley Fence & Deck is the best company to turn to for quality products and outstanding installations services. No other company in the region has installed as much fencing as we have, and, since 1967, we have maintained an unrivaled reputation for excellence in the Metro East area. We are committed to providing each customer with the greatest value for their investment in a wood fence, which is why, in addition to offering top-quality products, we provide exceptional installation services as well. For example, we use true 2 x 4 cedar rails to achieve optimal durability. We also mix the concrete on site and custom build fences without using pre-assembled panels. And, all of our installations are performed by trained, experienced technicians who are our own employees and never subcontractors, ensuring our high standards for quality are met. To give our customers peace of mind, we even provide a 3 year labor and material warranty. Chesley Fence & Deck is proud to be an A+ rated company with the Better Business Bureau. We serve the residents of Bellville, IL, and beyond. To learn more about our wood fence installation services as well as the financing options we have available for qualified homeowners, contact us today.